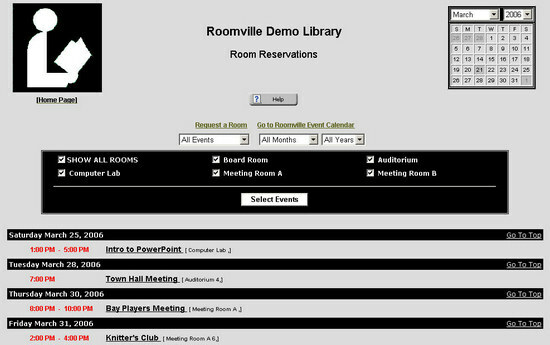 EKRooms, your online room reservation system is now available to be used with EventKeeper, by Plymouth Rocket. EventKeeper is the web calendar solution now in use at over 1000 locations across the United States and Canada. Put away your notebooks for good! Easy for you, convenient for your patrons. No setup fee, free technical support. Starting at only $250 per year. You will be amazed at what you can do with EK Rooms. EK Rooms - the affordable room booking solution for your organization!